A seamless customized garment devoid of any stitching, inter-locking or joining the cut pieces by any means using any type of yarn, for men, women and children’s wear, including designs, patterns and decorations/accessories is the subject matter of the present invention. Judiciously engaging, disengaging and crossing of one or more warp threads at varied levels weave the seamless garments. The invention also claims a weaving machine adaptable for engaging, disengaging and crossing of warps as per pre-designed patterns. Seamless garments are in vogue and the demand for such garments particularly under garments is increasing. As recently as l997 seamless garments comprised a mere one per cent of knitted production. Today's figure is more than seven per cent - and growing. A one-piece seamless garment is knitted by a new method on an improved circular knitting machine. The garment includes a body portion with a pair of leg receiving opening, a pair of side panels and a front panel and a rear panel joined at a crotch between the leg openings. Each of the front and rear panels include knitting courses formed during reciprocation of the machine that overlap the knitting courses of the other panel at the crotch. Other knitting courses are formed in the garment remote from the crotch and distributed among the courses that extend into the crotch to provide the garment with a contour matching that of the wearer. Integral leg portions may be provided to the garment by rotary knitting at each leg receiving opening of the body portion. A waist opening and waistband may also be provided as the garment is being knitted. The seamless clothing has transformed the overall worldwide production process. This technology can directly produce finished products, and lessens traditional process of the production. This leads to saving of production costs up to 40 percent compared to the customary knitting. The seamless knits are in tubular shape, which is laid-in elastic yarns, placed in the welt bands and prepared in the compressed areas. Circular knitting machines were mostly used by underwear makers since the beginning of the circular knitting technology in early 19th century. But the manufacturers in Italy merged the reciprocation technology for tips and heels of socks with intarsia for swimwear, underwear and outerwear during 80s. The machine manufacturing company, Santoni in Brescia is currently leading the market; although other companies like Sangiacomo, Italy and Merz, Germany are also famous players in similar knitting machine technologies. The technology of knitting seamless garments on V-bed machines have gained significant commercial acceptance since its introduction in 1995. Besides offering higher comfort and better fit to consumers by eliminating seams, the innovative technique creates entire garments with minimal intervention of cutting and sewing processes leading to substantial savings in cost and time, higher productivity, quick response and just-in-time production. Based on such technology, mass customization is enabled, which allows consumers to decide on the features of a garment. For woven products, they can be digitally designed; patterns digitally made; markers can be created; and fabric can be digitally printed. After printing, however, the fabric must be cut into its component parts and sewn. On the contrary, knitting a complete garment on these new seamless machines allows the product to remain in digital form until it reaches the manufacturing/conversion plant. This ability to communicate digitally offers the potential to completely change the concept of a factory. Knitted T-shirts are durable, versatile garments with mass appeal that may be worn as outerwear or underwear. Since their creation in 1920, T-shirts have evolved into a two-billion dollar market. T-shirts are available in a variety of colors, patterns, and styles, such as the standard crew neck and V-neck, as well as tank tops and scoop necks. T-shirt sleeves may be short or long, capped, yoked, or raglan. Additional features include pockets and decorative trim.T-shirts fit just about anyone in any size, from infants to seniors. Adult sizes are generally small, medium, large, and extra-large, while sizes for toddlers are detennined by month and weight. In addition, to compensate for the larger heads of infants relative to their bodies, shirts are specially designed with shoulder openings that may be fastened with buttons or snaps. Stretchable T-shirts are made of knit fabrics, especially jerseys, rib knits, and interlock rib knits, which consist of two ribbed fabrics that are joined together. Jerseys are most frequently used since they are versatile, comfortable, and relatively inexpensive. 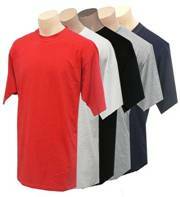 Many higher quality T-shirts are made of durable interlock rib knit fabrics. Neckbands add support to the garment and give the neckline of the T-shirt a more finished look. Neckbands are generally one-by-one inch rib knits, although heavier fabrics or higher quality T-shirts may require two-by-two rib knits. Neckband fabrics may be tubed rib knits of specific widths, or flat fabric that must be seamed. Additional T-shirt materials include tape or seam binding, made of twill or another stiff fabric. Binding reinforces the neckline and shoulder seams and by covering the seams, it protects them from ripping apart under tension. Alternatively, elastic may be used at the shoulder seams so they remain flexible. Thread is of course an essential element in sewing any garment. Several types and colors of thread may be used to make a single T-shirt. Some manufacturers use white thread for seams on all their shirts, regardless of color, thus eliminating the extra labor involved in changing the thread. Visible topstitching is done with a color of thread that blends with the fabric.Colourless, or monofilament, thread could be used for hems of any color fabric, again eliminating the need to change thread often, though monofilament thread may irritate the skin somewhat. Finally, optional decorative features may include trim, such as braiding, contrasting cuffs, appliqués, and heat transfer or screen print designs. Making T-shirts is a fairly simple and largely automated process. Specially designed machines integrate cutting, assembling, and stitching for the most efficient operations. The most commonly used seams for T-shirts are narrow, superimposed seams, which are usually made by placing one piece of fabric onto another and lining up the seam edges. These seams are frequently stitched with an over edge stitch, which requires one needle thread from above and two looper threads from below. This particular seam and stitch combination results in a flexible finished seam. Another type of seam that may be used for T-shirts are bound seams, in which a narrow piece of fabric is folded around a seam, as at the neckline. These seams may be stitched together using a lockstitch, chain stitch, or over edge stitch. Depending on the style of the T-shirt, the order in which the garment is assembled may vary slightly. Exposure to sun's harmful rays has become a concern to many people who enjoy outdoor activities. In addition to sunscreen and sun glasses, sun-blocking T-shirts are now available. Founded by Harvey Schakowsky, SPF Wear company has introduced a line of clothing, including T-shirts, that blocks out 93-99% of ultraviolet rays. A typical T-shirt blocks out only 50% of the rays. Using a fabric called Solarweave; these new T-shirts are made out of synthetically woven nylon treated with a special chemical substance.